You know what I’ve noticed? K-pop appears to be obsessed with Doc Martens, moreso than any other brand. What leads me to say this, you ask? Well, it feels like I’m seeing Docs in every photo shoot and music video K-pop stars are in. Seriously, go watch any music video, especially aegyo-filled ones, and there’s a very good chance you’ll see at least one pair of the signature lace-up boots. In case you live under a rock and don’t know what Dr. Martens are, let me give you a little history on the brand. Dr. Martens is a British brand that has been around for over fifty years, started up by Bill Griggs and Dr. Maertens in 1960. The brand quickly became symbolic of the working class and, later on, rebellious youths. Punks, goths, hipsters — anyone that wished to break away from society’s standards wore Docs to symbolize their individuality and rebellion. This is still true for nowadays, although Docs have become more of a stylish shoe of choice than an actual statement-making boot. You don’t need to be hipster or anti-conformity to wear Dr. Martens. Docs, depending on the style, are a great way to add some sass to your outfit. On a girl, they’re tomboyish and a little edgy. Even if they’re bright pink or lavender (like mine), they add a little cheeky boyishness to any outfit. Wear them like Amber, with knee-length pants and skinny jeans, or like KARA, with shorts and dresses. Docs, because they usually come in bright solid colors, add a pop of color. Don’t be hesitant to buy a pair of Docs if you’re afraid that you won’t get much mileage out of them — mixing colors and prints is a great way to experiment with fashion and your personal style. However, if you’re one of those people that prefers to match, buy solid white or black boots. Aside from these being colors that can be worn with everything, they’re also the most widely used in K-pop — white Docs especially. 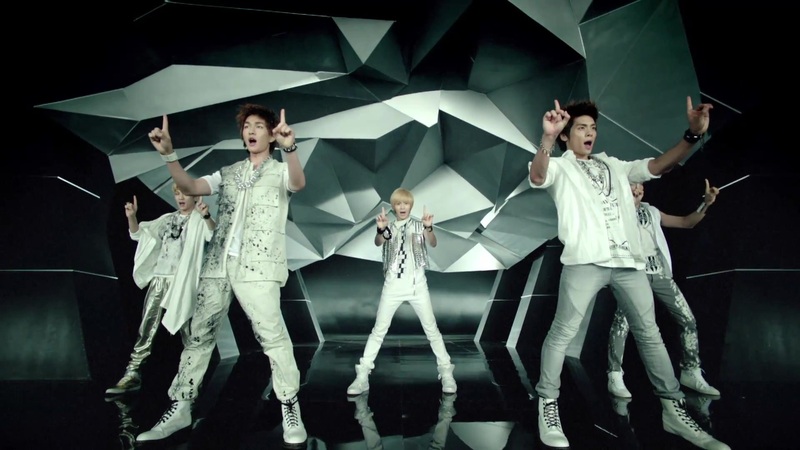 Amber wears white Docs in “Hot Summer,” Taemin in “Hello,” Onew and Jonghyun in “Lucifer,” all of Boyfriend in “Boyfriend,” and Seungyeon and Gyuri wear them in “Rock U.” Guys always wear their Docs with skinny jeans or fitted pants, normally with very casual outfits. 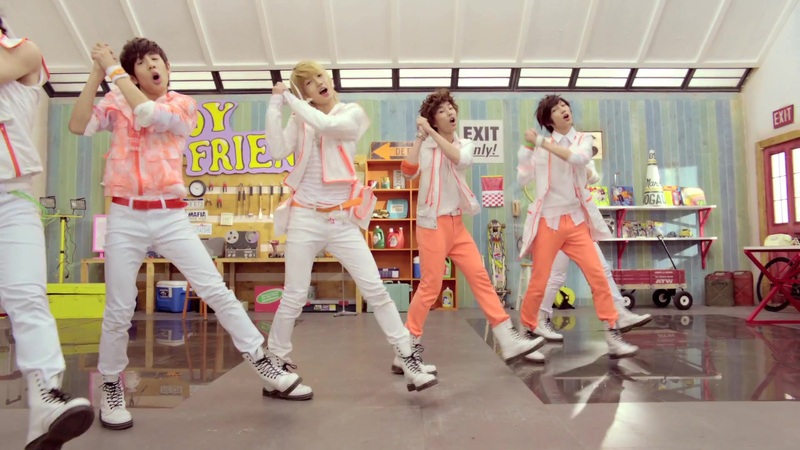 The styling depends on the mood — in an aegyo-laden video, like “Boyfriend,” Docs are worn with bright colors or pastels, creating a cheerful and fun look. But in more serious music videos, like “Be Mine,” Docs are worn to add a little extra grunge to a dark outfit. Either way works. Dr. Martens has some extremely cute shoes for sale now. With every collection, new styles and prints are made, and for Spring 2012, “Chalky Colours” are available for purchase. Not a fan of the cutesy color options? Try the “Rugged” collection, which is filled with heavier, industrial-style boots in dark, earthy shades. I’ve personally had my eye on these and these for awhile. I love the classic T-strap design of the first shoe, the white color making the shoes look even more innocent and pristine. The boots are girly and noticeable without being flamboyant. The floral print is simple and sweet, making the boots easier to wear with other outfits. Do you like Dr. Martens? Any shoes you’ve got your eye on?